Shanti is a tiny, brightly colored restaurant serving Northern Indian and Bangladeshi food. Though the spicy, lighter dishes of the South seem to be having a moment in boston — Dosas are popping up all over the place — the gentler, comforting dishes of classic Northen cuisine are what I'm craving on a chilly spring evening. Lately, this Savin Hill spot has been everything that is right with my work-filled weekends. They deliver, minimum $20. The delivery service isn’t especially fast—45 minutes to an hour—but they always get my order right, and the food is always worth the wait. Recently an editor overheard me placing an order to Shanti and mentioned that she had eaten at the lunch buffet at Shanti a day earlier—great food at an unbeatable $9.95 price tag, she said. My delivery order for one quickly snowballed into an order for four. So a few weeks later, I visited Shanti in-person to explore the buffet myself—partially to go to town on this $9.95 exploration, and partially to enjoy my meal in peace, as I have a superhuman ability to trigger breaking news by placing a delivery order to the Globe newsroom. My first dish at Shanti was the dreamy tikka masala: curried tomatoes in a light and creamy smooth sauce touched dry fenugreek and spices, with basmati rice. There's a reason this mild, rich dish is so ubiqutious. I I like it with chicken ($12.95) but you can up the richness with lamb ($14.95), tender shrimp ($14.95), salmon ($14.95) or the simple fresh cheese paneer ($12.95). 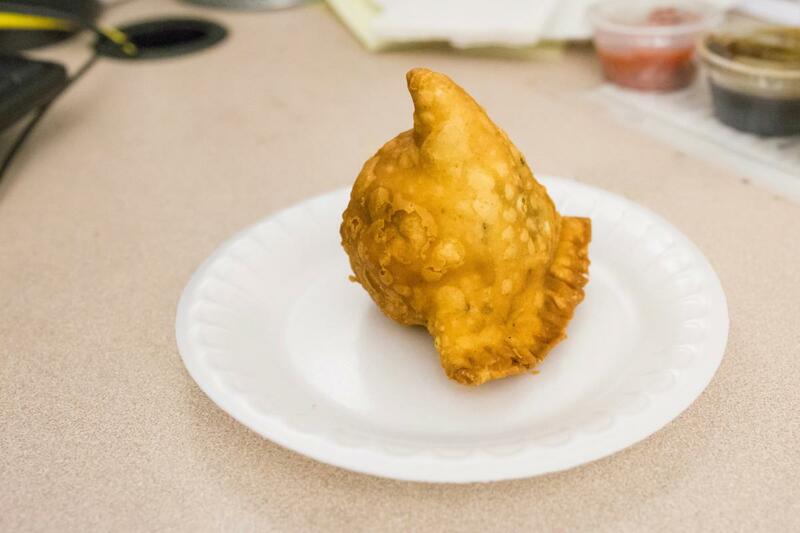 I also recommend the samosas for an appetizer, tiny puffed golden-brown turnovers served in pairs. The meat ($4.95) is stuffed with minced lamb, spices and nuts, while the vegetarian ($3.95) has green peas, potatoes, spices and nuts. 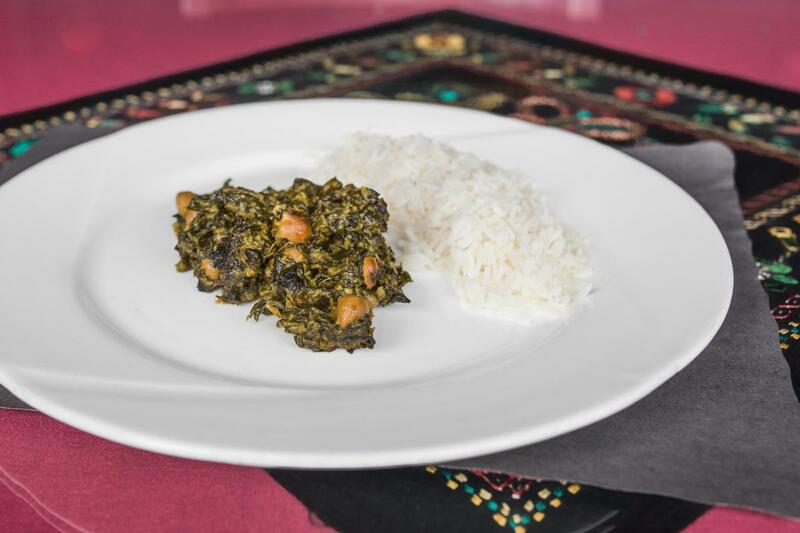 For your daily dose of delicious greens, go for the saag (pictured above), a creamy blend of spinach, garlic and ginger with basmati rice. You can opt for choice of proteins: chicken ($12.95), lamb ($14.95), beef ($13.95), goat ($13.95) or shrimp ($14.95), though I do okay with just the saag and rice on their own. 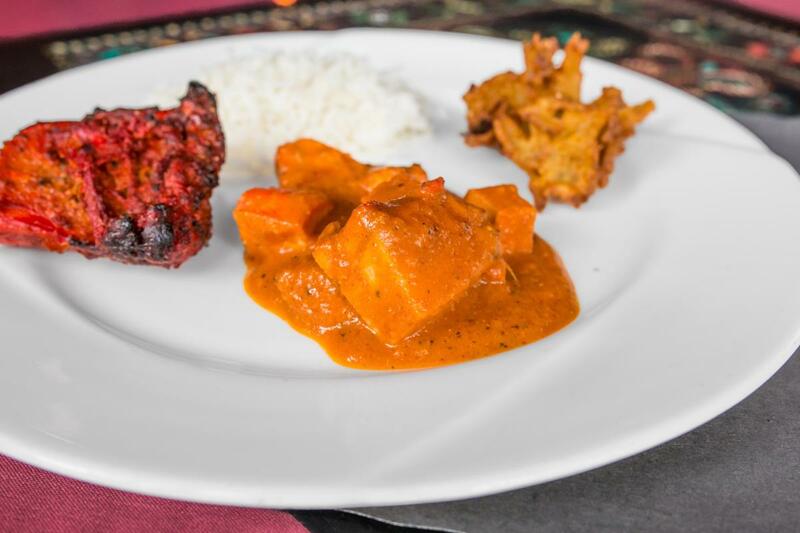 Meanwhile, the carnivores shouldn’t miss Shanti’s tender and juicy tandoori meats, slow-marinated in a clay pots, with the tandoori signature pinky-reddish color. Options include a variety of chicken, shrimp and lamb options in the $12.95–$20.95 range. The tandoori meats come with fresh-baked naan, which is intended as a side but just about steals the show from the rest of the plate. The naan will change. your. LIFE. It’s just unleavened bread, like a flat thick circle of pita bread folded in half, except it’s not “just” anything at Shanti—pillowy and hot and rich and delicious. If you like your naan with a little something sweet, I recommend the peshawary with ground raisins, almonds, pistachios and coconut ($4.95); the garlic naan ($3.95); and the aloo naan with mashed potatoes and spices ($3.95). 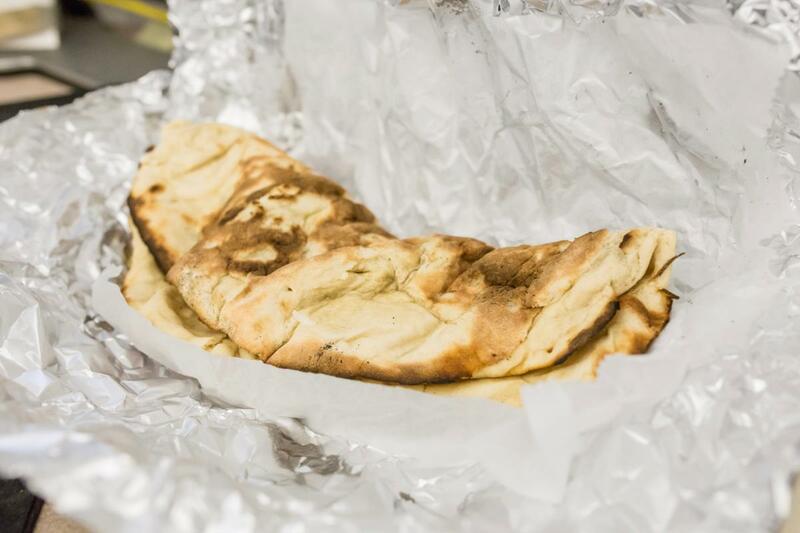 Pro tip: If you don’t make it through the entire batch of naan in one go, take it home, heat it up in the oven for about seven minutes, and indulge all over again. 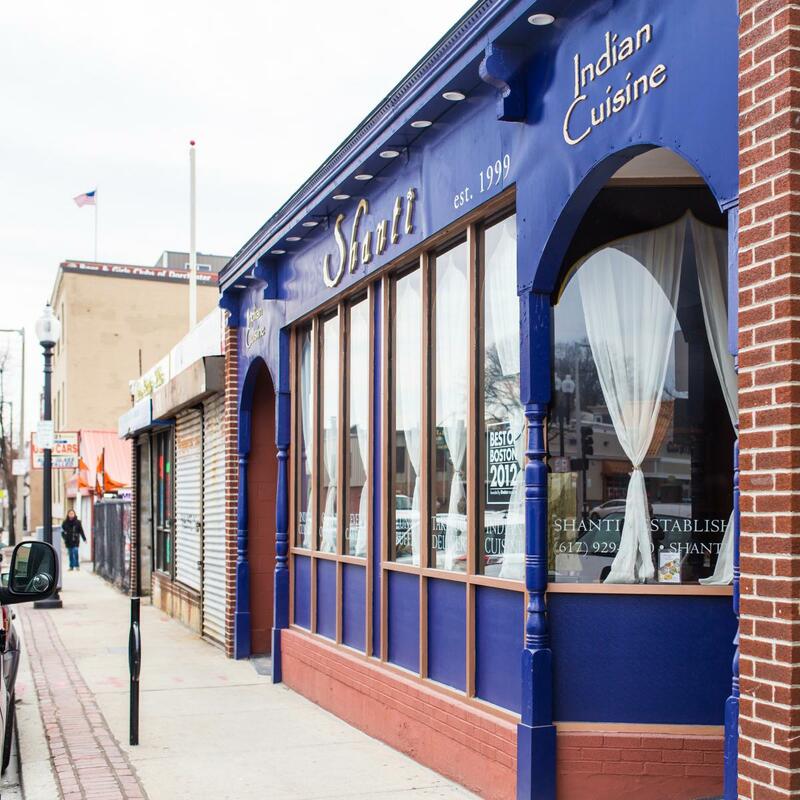 In 2013, the Shanti team opened another location in Roslindale, and in 2016, a third in Kendall Square. With these expansions, this hidden gem is well on its way to not being quite so hidden anymore—and deservedly so.